The Porch Swing has been load-tested and has a 500-pound weight capacity. Includes a free zinc-plated steel chain. I was planning to buy a wooden swing but I am tired of replacing things. It's comfortable and good looking. My husband and I had no problems assembling it. My front porch is complete! 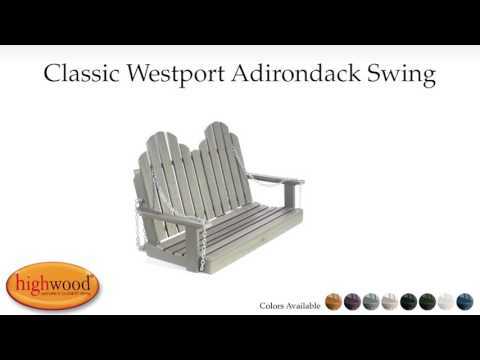 I love my new adirondack swing. The material is much more sturdy than I expected and really looks like wood. Had a hard time choosing a color, so I requested swatches for free! Only complaint is assembly got a bit tough to get screws in. Found it worked much better if i left all screws loose until all were inserted.